As a filmmaker and storyteller, when planning my travels in search of stories I always seek out destinations with rich color and culture. I set my lens on exploring the less-traveled city of Mérida in the Yucatán for this very reason. 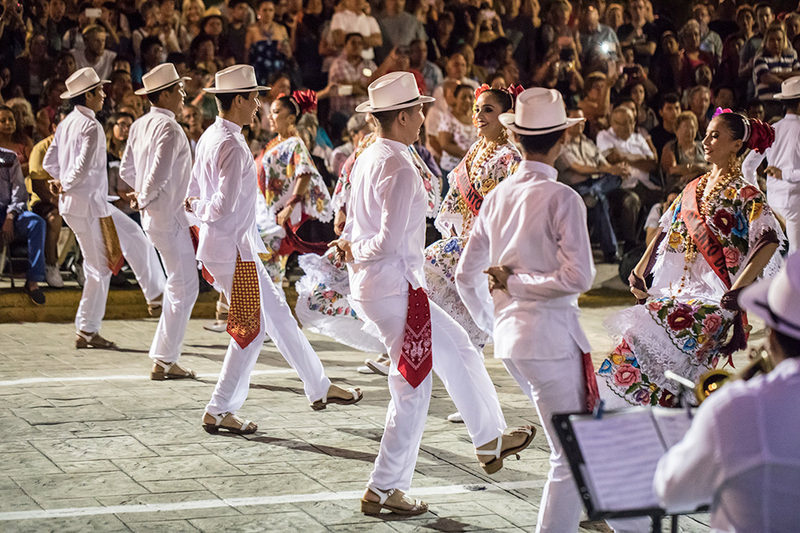 After arriving in this vibrant Yucatán city and wandering around town to practice my Spanish with locals, I quickly found dancing plays such a role in the community here. I’d heard about La Vaquería while researching Mérida but seeing it in person was such a treat! There were celebrations in the parks and squares that happen almost every night of the week. The history of La Vaquería is that the Mayans came here the first time and tried to change the local religion. Each town in the Yucatán the Spaniards named after a saint. All towns in Yucatán have a real Vaquería once a year when the main Catholic saint of the town is celebrated. 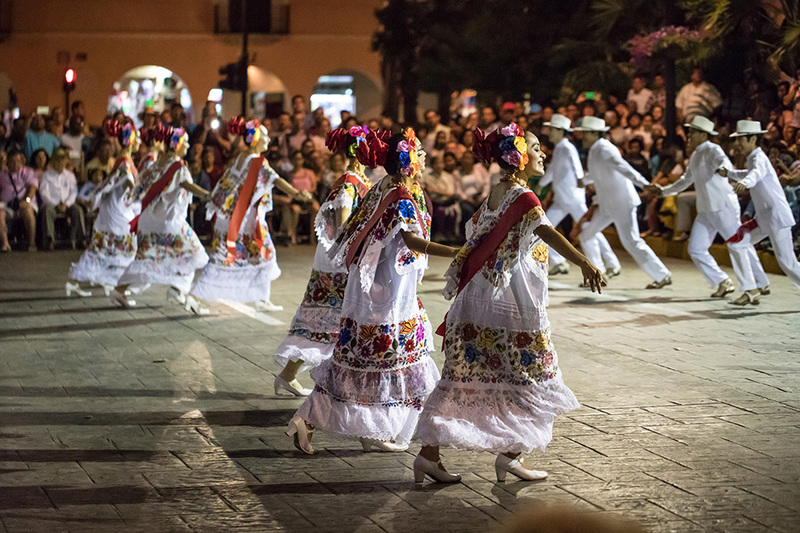 In Mérida, the real La Vaquería is celebrated on the same day as when Mérida was founded: January 6th each year. The one on Monday’s in town is more historical while the yearly real celebration in each town has some jaranas and after they play contemporary music. Jarana cannot be directly translated to its true meaning in English. 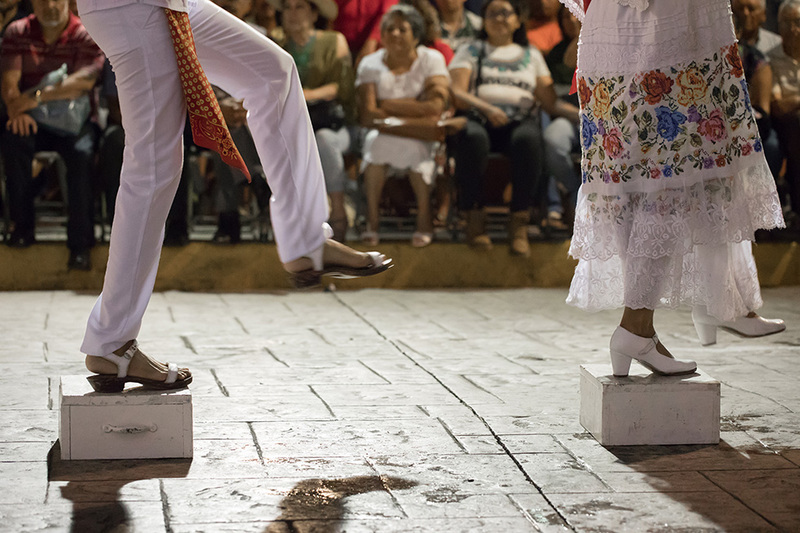 Jaranas are typical rhythmic dances to the Yucatán Peninsula. Jaranas are always done in pairs with dancing, almost like a competition between a man and a woman while a band is playing. The men wear fancy open-toe heeled white shoes with shiny gems on them with white pants, white shoes, and a white hat. The ladies wear closed-toe white heels decorated with flowers, an all-white dress with beautiful stitched colorful flowers, and ribbon woven flowers in their hair. Showing how a bullfight is taking place. The woman is the bull and the man is the bullfighter, or in Spanish el torero. Where the men and women place a tray with drinks on top of their head to see who is better. An intricate dance through the mixing of the ribbons strung to a tall pole. Dancing in a small wood square that looks like a stepstool box. ‘Almud’ is the word for what the people of the Yucatán used as a way to measure weight of the grains such as beans, corn, and flour before the weighing scale was invented. Loved this story and it’s interesting places to go. Kristen, you have found yourself in this journalistic job that you’ve created. Great photos too! The hula, bon odori and whirling dervish! These look incredible too. Just love it all. 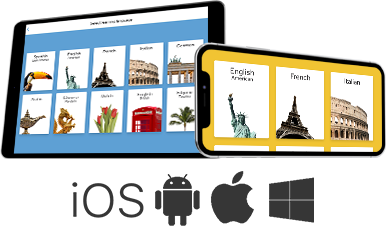 So glad you hired Kristen to create these videos for Rosetta Stone! She’s my favorite travel filmmaker. Kristen, this is awesome! I want to go down and learn how to dance now too! !